Having a home theater system is an exciting option. Watching a movie in a proper home theater system can really enhance the listening and viewing experience. If you’ve been thinking about getting a home theater system, you’re in the right place. In this article, we will help you find the best budget home theater system. When we’re talking about home theaters, we have to understand that we’re not talking about one particular product. It is a system that requires a lot of different items to be working together to provide the greatest possible experience while watching a movie or a TV series. Your home theater system could be as simple as a small 32-inch LED TV hooked up to some nice pair of speakers and a home-theater-in-a-box type system. It could also be something more sophisticated like a custom-built home theater system with a powerful HD video projection and in-wall speakers. So there is quite a bit to consider when building your home theater system. Let’s take a look at some of the best budget home theater system. You never know, you might just find a component or the entire home theater system after reading this article. 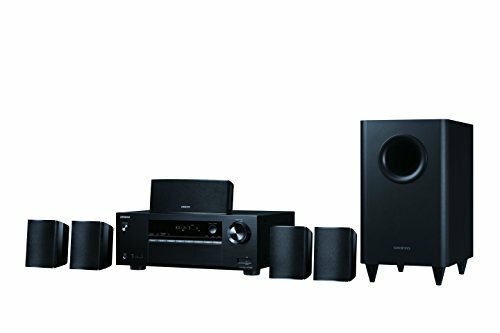 The Onkyo 5.1 Channel Home Theater Package provides the complete home-theater-in-a-box system. All you would need is a good LED screen and you pretty much the complete home theater system. Let’s take a look at the particular features and specifications offered by this home theater system. The system comes with five surround-sound speakers operating at 105 W/Ch. But more importantly, the speakers are six-ohm rated, which is the ideal balance between the speaker’s output power and energy input needs. Moreover, the speakers operate on something called a discrete output stage circuitry, which is further supported by its five channel analog amplifiers. The system offers four input slots and one output slot for the HDMI connections. Each of the input connectors is dedicated to specialized tasks such as gaming, DVD, storm box, etc. Its audio return channel feature allows us to connect our TV using a simple HDMI cable without disrupting the sound or the need for independent input and output wires for both audio and video. The system supports all of the widely known technologies we’ve come to expect and love. For example, it supports TrueHD, Deep Color, DTS-HD Master Audio, XAVI, etc. 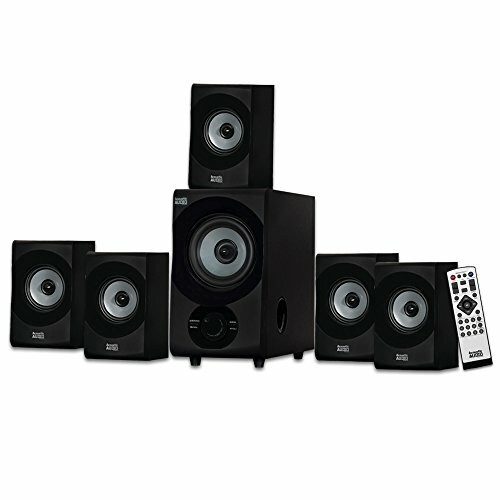 Furthermore, the size of the speakers makes the system ideal for small living rooms, home offices, conference rooms, etc. The speakers were designed to be just the right size for smaller room sizes. Lastly, the speakers have built-in automatic equalizers that not only adjust the sound according to a room’s size and acoustics but also according the audio being played on the speakers. It is perfect for those who don’t like to tinker with their electronics but still expect the perfect end result. Auto equalizer provides the greatest possible sound quality according to your living room. 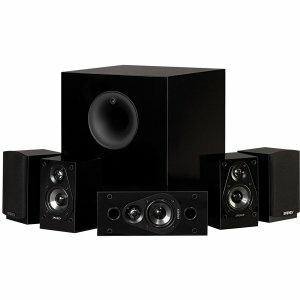 Energy 5.1 Take Classic Home Theater System offers five speakers and a powerful sub-woofer. It has four gloss black two-way energy satellite speakers and one gloss black energy center channel. You can use the satellite speakers to set up a perfect surround system in your living room, which works perfectly with the center sound channel speaker. The subwoofer is a 200-watt Energy subwoofer that can satiate when the most bass hungry folks out there. The subwoofer has a front-firing port that operates on an eight-inch driver. The subwoofer is based on a patented technology called, Ribbed Elliptical Surround, which is why it produces such high-quality sound. The home theater system works on the flat on-axis frequency response system on a wide bandwidth range. Meaning, the speakers can reproduce the exact sound in a uniform manner. Thus, you can expect these speakers to fill up any room with sound without any distortions completely. The speaker system utilizes a state-of-the-art distortion and resonance-free filters that will provide you with clear and audible sound even at high volume levels. State-of-the-art resonance and distortion free speakers. Acoustic Audio by Goldwood Speaker System is a Bluetooth powered speaker system. It has two speakers and a subwoofer. The multimedia speaker system also supports USB devices along with other storage devices such as SD cards, etc. It has a collective power rating of about 350 watts with an even better frequency response rate of 40Hz-20 kHz. The sound system also features a built-in integrated audio amplifier and an enhanced bass booster design. The front panel of the system has all of its input controls, volume panel, and menu controls. It also controls with a highly-intuitive remote control. Its plug-and-play is inside a computerized enclosure design, which prevents the panel as well as the wires from getting damaged. It features a number of input connections aside from Bluetooth, including RCA input and out and a simple aux for ease of connectivity. The speaker system can connect with any type of media device including laptops, smartphones, gaming consoles, etc. All you would need is an aux cable or an RCA audio output cable, and you will have the perfect surround sound system for your room. The 350-watt speakers along with its enhanced bass booster ensure maximum audio volume without affecting the audio quality. Based on all of the information we’ve covered, it is no doubt that all three speakers offer incredible value. It is important to remember that all three home theater systems are slightly different and offer a different type of experience. For example, Acoustic Audio by Goldwood can’t compare to Onkyo simply because Onkyo theater system is a 5.1 system whereas Goldwood is a 3.1 speaker system. However, since we’re going to recommend one to help you choose the best budget home theater system, we can’t help nudge you towards the Onkyo Home Chanel Home Theater Package, which offers the most out of the three home theater systems we reviewed.